103: You guys are great! Thanks for all the helpful advice you have given on the Australian table runner. You will get to see what I do with it in awhile.. (it might take me awhile, but when I am done, I will definitely show you. And even better you all helped me hit my goal of 20 comments on my 101st post!! So now I have to draw names. I will do that in the next post so come on back for it. I will announce the lucky winner then. What I really have enjoyed the most is all the warm fuzzies you gave my blog through your comments. I am glad that you like my little stories and thoughts and pictures. Linda and I are working on getting an even better camera, so keep checking back, soon I will have even better pix for you. Here is a little thing that I just ordered today that I want to share with you. 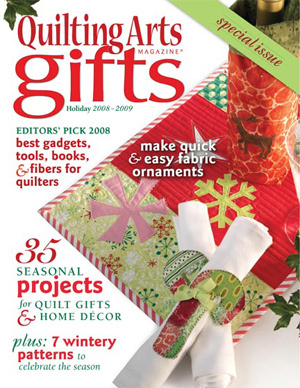 It is Quilting Arts’ Gifts 08…their special Holiday issue. Linda said that she thought last year’s looked lame to her, but I looked at the table of contents, and I think I am going to like it, so I ordered it. I could be wrong, but I think I am right, so if you get it too, let me know what you think of it. I will tell you more about it when it arrives.. I have no idea when that will be, but probably in September sometime. I know, I know, how can I think of Christmas now? Well, that is what 20 years in the retail industry will do to you folks, it’s not pretty. I am pretty sure Publishing is like that too, even worse. They all are probably looking at fall ’09 already! Okay, so remember come back for post 104….the winner of my 101st post giveaway will be announced!